Amazon.com description: Product Description: To what extent should anybody who has to make model forecasts generated from detailed data analysis adjust their forecasts based on their own intuition? 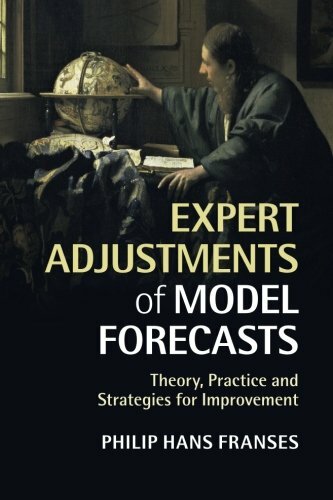 In this book, Philip Hans Franses, one of Europe's leading econometricians, presents the notion that many publicly available forecasts have experienced an 'expert's touch', and questions whether this type of intervention is useful and if a lighter adjustment would be more beneficial. Covering an extensive research area, this accessible book brings together current theoretical insights and new empirical results to examine expert adjustment from an econometric perspective. The author's analysis is based on a range of real forecasts and the datasets upon which the forecasters relied. The various motivations behind experts' modifications are considered, and guidelines for creating more useful and reliable adjusted forecasts are suggested. This book will appeal to academics and practitioners with an interest in forecasting methodology.